In the conference room at the Wells Fargo offices in downtown, Jorge Villacampa pointed out a mural of Miami on the wall, saying “this is just one way we connect to the community.” Among the photos is an image of a Wells Fargo & Co.’s Express office in Camaguey, Cuba, in 1924. Though Mr. Villacampa says Wells Fargo will do business “with anyone, no matter how large or small,” the Hispanic business market in Miami will always be especially important to Wells Fargo, as it’s the largest segment of the population here. 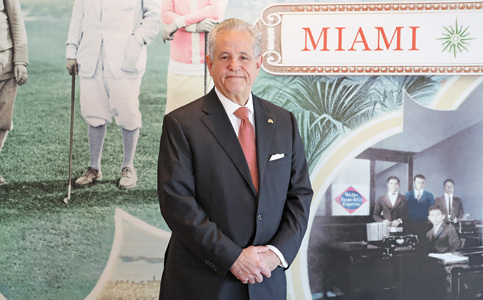 Wells Fargo is the third largest US bank by assets, but Mr. Villacampa says it still operates as a community bank in Miami, with the mural being just one of the many ways Wells Fargo keeps its local flair. The new Wells Fargo regional president for South Florida says hiring local management and staying engaged in the community keep Wells Fargo competitive with local community banks. After a national reorganization of its management, Wells Fargo is trying to bring leaders closer to employees and put customers at the forefront, Mr. Villacampa said. “We had our problems and they are well-documented… and now we’re doing everything we can to change for the better,” he said. In addition to restructuring its human resources and recruiting departments, Wells Fargo eliminated sales goals for its employees at all branches. “A banker shouldn’t feel like they need to sell a product that the customer doesn’t need,” Mr. Villacampa said. To hear from customers and train his 1,200-person team, Mr. Villacampa said most days he can be found “in the field,” visiting one of his 68 branch locations in Miami. Even on weekends, he stays busy visiting branches and participating in community projects, both with Wells Fargo and his family. Miami Today reporter Gabi Maspons interviewed Mr. Villacampa at the Wells Fargo offices Downtown. The interview, recorded by Jahmoukie Dayle, can be found at http://bit.ly/2uNHy0Q.